Gear oil and hydraulic oil are two different fluids that come under the category of lubricants. The formulation of these lubricating oils varies significantly according to their applications in equipment. In order to elicit high performance and machine life, optimal oil formulations are required to suit the applications. There are various types and combinations of hydraulic fluids and gear oils either in the form of mineral oils or synthetic materials, all blended with additives. The main function of gear oil is to protect the gears that are working under high pressure and at high speeds. Gear oils, which are available in many combinations, are used for lubricating gear contacts with the sliding and rolling motions used in industrial equipment, automobiles, and other machinery. The oil exhibits anti-friction properties while it cools and removes the heat that originates with the friction between the parts. Lowly loaded spur gears need only oils that provide protection against rust and oxidation, whereas, the heavy loaded ones need high levels of EP additives. Higher-viscosity oils protect the gears well and transfer the lubricant throughout the gear train smoothly. Such oils have a strong smell of sulphur due to the additives present in them, which helps maximum pressure protection. The oils that contain EP (extreme pressure) additives have phosphorus or sulphur compounds and are corrosive to yellow metal bushings and synchronizers. The GL-1 (Gear Lubricant-1) gear oils do not have any EP additives, and so they are used for applications on parts made of yellow metals, such as copper and brass. Gear oils are classified into several groups as per the GL ratings. The advanced gear boxes require GL-4 oils; and, therefore, while selecting gear oils, it is good to ensure that they conform to the manufacturer’s specifications. Today fully synthetic gear oils are used in vehicles, as they show more resistance to shear breakdown than the mineral oils. However, high quality mineral oils are the best options, for they are thicker, having better viscosity coefficients than the synthetic gear oils. Identifying the appropriate gear oil for a specific application lies in evaluating viscosity, base oil, and the lubricant. Hydraulic oil is a lubricating medium that transfers power through hydraulic systems, like excavator booms, hydraulic brakes, power steering systems, lift, etc. It derives large amounts of energy using comparatively thin tubes and hoses. The key elements of performance in quality hydraulic oils are their tough resistance to volume reduction under pressure and high viscosity. To facilitate this, hydraulic oils are made of oils and additives to transmit the power smoothly and effectively while performing as lubricants and coolants as well. Hydraulic oil can reduce wear, rust, and corrosion in hydraulic equipment. Since hydraulic oil is flammable, it is unsafe to bring it close to any ignition source. In earlier times, fluid power mechanisms were run with water as the hydraulic medium. Due to its corrosive nature and lack of lubricity, water was replaced by petroleum-based oil. Water-in-oil emulsions are composed of emulsifiers, additives, 35-40% water, and 60% mineral oil. Most of these mineral-oil hydraulic fluids are generated from dewaxed paraffin-based crude oil. Additives are then added to get the desired properties. Synthetic hydraulic fluids, which are fire resistant, are the latest in the array, finding places in more and more crucial hydraulic applications. Regardless of what is stated above, the functions of hydraulic oils in any given application system can be summarized as: (i) Transmitting power efficiently and cost-effectively (ii) Lubricating the system (iii) Resistance to foams (iv) Capability to release air (v) Thermal, oxidation, and hydrolytic stability (vi) Resistance to corrosion, removing impurities, and anti-wear performance (vii) Filterability (viii) Heat dissipation (ix) Viscosity (x) Fire and flash resistance, and (xi) Low coefficient of expansion and low specific gravity. The key to predicting the behavior of a hydraulic fluid lies in the analysis of its viscosity while moving through a hydraulic system. Low viscosity oils fail to seal properly, leading to pressure loss, seepage, and component wear. Fluids that are too thick will reduce the system’s efficiency. Punalur Chandrasekaran. "The Difference Between Gear Oil and Hydraulic Oil." DifferenceBetween.net. 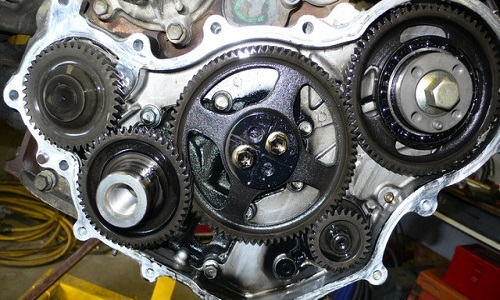 April 2, 2019 < http://www.differencebetween.net/object/auto-object/the-difference-between-gear-oil-and-hydraulic-oil/ >.